Non-meat ingredients, such as additives, property enhancers, and binders, are used in the meat processing industry. A majority of these ingredients can affect the properties of processed meat and can alter the taste, color, texture, flavor, etc., of the principal components. Non-meat ingredients are extracted from various sources. The food industry is a major end-user segment for non-meat ingredients. 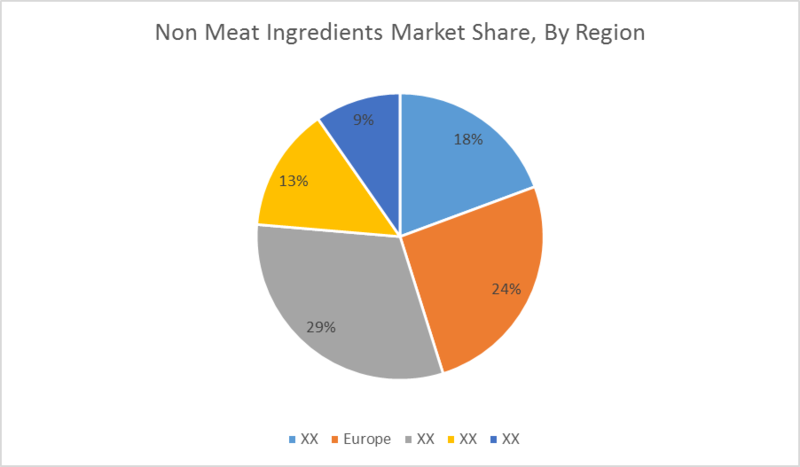 The global non-meat ingredients market was valued at USD 31 billion in 2015 and is forecasted to grow at a CAGR of 3.7% during the forecast period (2018-2023). This growth mostly high in developing countries such as China, India, Vietnam, Thailand, and Japan. Non-meat ingredients can provide a variety of textures and flavors. Economics, variety, convenience, and health oriented diets are making consumers more receptive to nonmeat ingredients in meat products. They are used extensively in the processing of beef, pork, mutton, poultry and other animal fats & products, etc. Robust growth of meat processing is the key driver for the increasing demand for non-meat ingredients. Other factors like growing urbanization and the Western culture influence on food habits are also driving this market. These factors are summing up the demand for processed meat, raw-cooked meat, etc. Market demand for non-meat ingredients is high in developing nations. The demand for these ingredients from emerging economies, such as China, India, and Malaysia, is expected to grow steadily due to the high consumption of processed meat, such as canned fish, canned meat, and sausages. The demand is saturated in some matured economies, such as North America and Europe, owing to the increasing popularity of processed meat as consumers are provided with a large selection of meat products. However, factors, such as quality standards, clean labeling and health concerns, are hindering the market. Investors are finding opportunities in exploring technological advancements in this sector. The global non-meat ingredients market is segmented by ingredient and by product type. Due to their enhanced taste and improved storage & preservative properties, essential ingredients used in the processed meat industry are salts, phosphates, transglutaminase, proteins, and cellulose derivatives such as pectin. Some of the non-meat ingredients used to increase the volume of the products are fillers and extenders, which are used in large quantities as they provide variety of textures and flavors. However, ingredients, such as salt & preservatives, coloring and flavoring agents, pertain to one or many properties of the products and are used in minimal proportions. By product type, the market is classified into freshly processed products, raw-cooked products, precooked products and others. Europe is expected to be the second most dominating market for non-meat ingredients. The high demand in Asia- Pacific reflects the incorporation of advanced meat processing technologies, and the improving purchasing power, owing to economic development in the region enables to records a high growth rate during the forecast period. The high market demand is anticipated due to an increase in the branding and marketing of different varieties of processed meat products in the region. Key players in the global non-meat ingredients industry are Kerry Group Plc, Ohly Gmbh, E.I.Du Pont De Nemours and Company, Proliant Meat Ingredients, Wenda Ingredients, Alicia Srl, Campus Srl, Redbrook Ingredient Services, WIBERG Gmbh, Advanced Food Systems Inc.